ALL good things come to an end as a man of your parish by the name of Tom Brady may or may not discover in the coming days. With only a fleeting interest in American football, fuelled by Sunday nights at Budweiser parties as Irish Central readers may know, it was interesting to digest the reaction to Brady’s Super Bowl defeat on Sunday. Watching from afar, the consensus seems to be that Cavan’s grandson may soon call it quits and enjoy the millions his quick thinking brain and quicker hands have earned him over the years. Good luck to him if he does go down the retirement road. Brady has been a great servant to his sport and I’m sure he will be able to fill his time at home with his supermodel wife all day. Another sportsman called time on his career this week, just hours after Eli Manning put Brady and the Patriots back in their box in Indianapolis. Monday was almost over when a big story broke from the home of hurling, otherwise known as Tipperary. Lar Corbett, Hurler of the Year in 2010 and still short of his 31st birthday, met with manager Declan Ryan over the weekend and told him it’s all over. Then he sent a text message to his teammates informing him of the decision. No sooner had the first text landed than word spread across the land and beyond. One of the greatest hurlers of his generation would play the game no more, not in the Premier County jersey anyway. The news has come as a shock to those who value hurling as probably the greatest field game in the world -- with apologies to those who idolized Brady and Manning on Sunday night of course. Played well – as they tend to do in Tipperary and Kilkenny and such places – hurling is the fastest, most mesmerizing, most breathtaking game you will ever come across. If you do take a trip to Ireland anytime in the near future make sure that a hurling match is right up there on the itinerary, alongside the Book of Kells, the Hill of Tara and the Guinness museum. You won’t be disappointed, but I digress so back to Corbett and the story in hand. Corbett, an All-Ireland winner two summers ago, was as good a player as has come out of Tipp, and that is saying something. Like Brady and Manning, he has an eye to ball coordination that has to be seen to be believed. Unlike Brady and Manning, he controls the ball with a stick, often at speeds worthy of an Olympic sprinter. Corbett has an eye for goal. He always had, as the back of the net at Semple Stadium, Pairc Ui Chaoimh and Croke Park will readily testify. He also had that talent unique to the truly greats – an ability to bewilder defenders and stun spectators and all at the same time. He was a great hurler and a great entertainer. And he was never paid a red cent for his talent. Therein lies the rub. 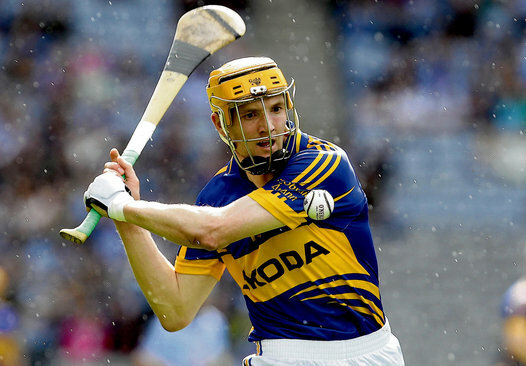 While Brady will never get to the bottom of his sport-induced dollar pile, Corbett has had to work for a living for each year he’s been a stalwart of the Tipperary hurling team. Or not, as the case may have been. In the last 18 months, he was a guest on the Late Late Show when he explained to host Ryan Tubridy how difficult it is in the current economic climate to marry hurling with the search for work. Since then, thankfully, he has opened a pub in Thurles, but running a business comes a price. This week hurling paid that price and Corbett announced that he is to concentrate on his new job at the expense of a game he loves and a game that loves him back. There’s little the GAA can do to stop him. Until they start to pay Corbett and his likes for making the Munster final his “private property,” as the Irish Independent put it so eloquently on Tuesday morning, there is little they can do to stop his like retiring at too young an age. Professionalism would make a difference – as a certain Cavan man called Tom Brady would probably tell you. RUGBY: God help us, but this recession must even be hitting the rugger types judging by their behavior on Sunday when they booed English referee Wayne Barnes for sending Stephen Ferris to the sin-bin and awarding Wales a match winning penalty in the dying seconds of their Six Nations game with Ireland. Ferris did commit a spear-tackle style foul on Ian Evans, regardless of what the rugby fans thought. Nor did they protest as much when Welsh lock Bradley Davies was sin-binned for a similar act on Donnacha Ryan earlier in the match. And who can forget the furor when Brian O’Driscoll was spear-tackled on a Lions tour all those years ago? You can’t have your cake and eat it if you’re an Irish rugby fan – particularly in a recession. They might acknowledge that now in the gentleman’s game. And let the referee do his job. SUPER BOWL: We were rooting for the Giants on Sunday night, so the right team won as far as we were concerned, even if it was almost impossible to stay up for the final quarter – particularly after that yawn fest from Madonna at halftime. Loved the tweet from a friend of a friend by the way which read, “Why would you watch a sporting event in a sport that you don’t follow the 364 other days of the year?” Fair point, but the hash tag said a lot as well. It read possibly a girly question. It was. By the way, we think Manning is an Irish name in this part of the world. Any chance we can claim Eli as well as Tom Brady now? GAA: The recent shemozzle in Portlaoise at the match between Dromid Pearses and Derrytresk is still causing something of a stir. Derrytresk are due to play in the All-Ireland junior club final at Croke Park on Sunday and have appealed against the suspensions handed down to eight of their players for their part in the ugly scenes. We have yet to hear, however, if they are to appeal the proposed 48 week suspension for the woman who hit Kerry star Declan O’Sullivan with her handbag after the final whistle. The headline on this story in the Irish Sun was “Dolce and GAA-Ban-A” We love it. SOCCER: Form is temporary, class is permanent. So said Mick McCarthy when Kevin Doyle scored the winner for Wolves and for him at QPR on Saturday. Not alone did Doyle probably save Mick’s job, he also reminded Giovanni Trapattoni and some doubting Irish fans what he can do. With the year that’s in it, that may well be important -- particularly with a friendly against the Czech Republic coming up at the end of the month and an Irish squad announcement on Friday. SOCCER: Anthony Stokes is enjoying quite a season with Celtic, but it’s fair to assume he won’t be going to the European Championships with Ireland this summer after falling foul of Giovanni Trapattoni. Interesting to note then, courtesy of my new colleagues at the Irish Sun, that Anthony has the second best scoring rate of any striker eligible for the Irish team this season. Only Robbie Keane has a better scoring ratio, and two of those goals came in the MLS. GOLF: Padraig Harrington has caused something of a stir with his comments about Rory McIlroy, Graeme McDowell and the British golf team at the Brazil Olympics in 2016. Essentially, if I am reading him right, Padraig thinks Rory and Graeme should declare for Britain to allow two other Irish golfers play for Ireland. He even thinks it’s a patriotic thing to do. Not quite sure some of the “wrap the green flag around me” brigade would see it that way. THE young Sunderland winger James McClean, late of Derry City, is a serial tweeter and well worth following if you are into such things. He is also a decent footballer and has an outside chance of making Giovanni Trapattoni’s squad for the European Championships in Poland this summer. McClean did his chances no harm at all with another impressive performance -- and the only goal -- as Sunderland won on Stoke on Sunday. He also put a BBC presenter back in his box when he announced that McClean was Northern Irish. The player, now declared for the Republic, quickly tweeted that he’s Irish and fired a verbal volley at the presenter -- of East Belfast extraction. Priceless. RED Bulls target Stephen Ireland told his Aston Villa manager Alex McLeish to eff off when he criticized him for making a mistake during his team’s defeat at Newcastle United on Sunday. Little wonder then that he was substituted soon afterwards -- although McLeish did claim the two incidents were unrelated. Ireland’s girlfriend was also in the news this week, again claiming that he wants to play for his country as she promoted some new musical she’s starring in on the other side of the Irish Sea about the WAGS who hang around footballers like the young Corkman. If Ireland really wants to play for Ireland, he should pick up the phone, ring Giovanni Trapattoni and do his own talking. His girl can talk all she wants – she may even be able to sing – but she can’t play football. And she won’t be going to Poland this summer. Just like Stephen Ireland.